Every year, I try to make it to the “Christmas at the Zoo” event here at the Honolulu Zoo. It always makes for interesting shots like this one. As discombobulating as seeing a Chimp drinking heartily from a Gatorade bottle is, their technique for opening it is even more interesting. The Chimps just twist it open with their teeth. What a set of jaw musculature! If this Chimpanzee gazed upon Yorick’s skull, there’ll be no lamenting to Horatio about a life lost and realizations about death; he’d merely snort at the lack of a sagittal crest. Puny Humans! 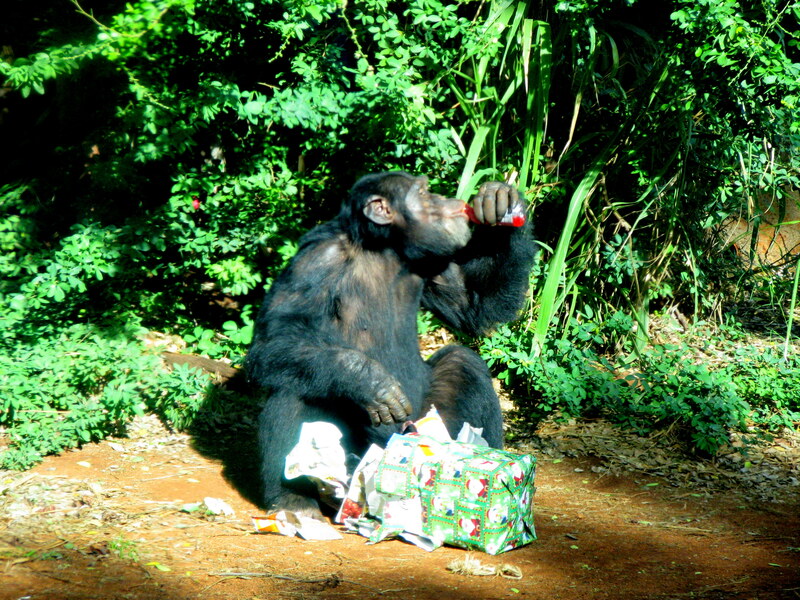 This entry was posted in Animals and tagged Chimpanzee, Christmas. Bookmark the permalink.